Brennan is in denial, and Angela and Hodgins are considering big changes. 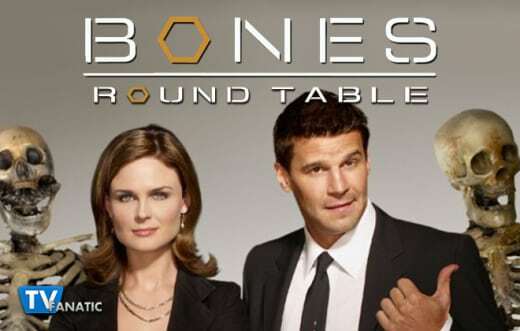 Last week, we were offered two back-to-back episodes with Bones Season 10 Episode 17 and Bones Season 10 Episode 18, giving us plenty to discuss. Join TV Fanatics Mary Kate Venedam, Christine Orlando and Ashley Bissette Sumerel - as well as Bridget Liszewski from The TV Junkies - for a discussion of "The Lost in the Found" and "The Verdict in the Victims." Should Daisy be considering going on a date? Bridget: I didn't find it unnatural that she'd be considering it. It's been awhile, but clearly not enough time since Sweets' death. I think it was a good way of showing how his death will continue to affect them all in different ways. Mary Kate: Probably not. She is still mourning Sweets and simultaneously raising her young son. It's not unusual for her to consider it, but I don't think she should follow through until it's been more time. Christine: I think it's still too soon. Moving on after Lance is going to be hard. I can understand wanting to go out and have some fun, but if it turns into more than that, at this point I think it's just asking for disaster. She needs some more time. Ashley: I agree. It's too soon, particularly considering the baby. But, I can see her wanting to at least consider it. Were you surprised by Brennan's denial at how far along she was in her pregnancy? Bridget: Yeah. Initially, I felt a little like Booth about the whole thing, like I didn't get what was going on with this story line. But in the end it was a good segue into how she can't control everything in her life and the discussion about Booth and Brennan's dangerous jobs. Mary Kate: Yes. Considering how rational Brennan is she would be meticulous about how far she is in the pregnancy. Her reasoning made sense, but that type of denial doesn't seem common. Christine: I agree, at first it made no sense how someone so logical could be so illogical. Plus, by this point in her pregnancy I'd assume she's seen a doctor and they tell you your due date based on many factors. I can't imagine her doctor would allow her to delude herself to that extent. Ashley: Very! It's just odd for her character. Like Christine says, she's a logical person, so this just doesn't make sense. I'm interested to see how her pregnancy storyline continues to play out. 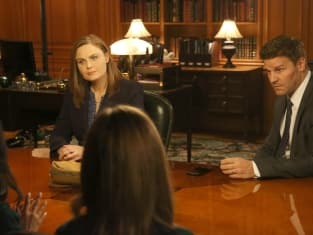 Bones Photos from "The Lost in the Found" and "The Verdict in the Victims"
How do you feel about the dynamic between Booth and Aubrey? Bridget: I have always been a big Aubrey fan and one of the reasons I enjoy him so much is because of his dynamic with Booth. He's the funny one next to Booth's straight man and these two bring me joy every week. I loved Aubrey at Booth's home with Christine because it just showed how he's worming his way further and further into Booth's life. Mary Kate: I'm loving Aubrey more and more. The relationship with Booth is similar, but different from Sweets. There is definitely more respect than there was at the beginning of the Booth/Sweets relationship. Christine: Aubrey is wonderful. I really wasn't sure how he'd fit in in the beginning, but he's turned out to be one of my favorite characters and has great chemistry with almost everyone else on the show. Ashley: I agree. I think he's fantastic, and I like his relationship with Booth. The two of them work really well together, and I'm glad Aubrey is becoming a friend as well as a partner. Should Angela and Hodgins move to Paris? Bridget: I certainly don't want them to move to Paris. I wouldn't be surprised at all, though, if we saw Angela leave the lab. I don't think Hodgins could ever leave because this is what he loves, but Angela on the other hand wasn't supposed to work in a lab. She was an artist and I wouldn't be surprised at all if she leaves the lab to pursue her passion. Mary Kate: No. I love Angela and Hodgins. As much as I like Booth and Brennan, if Angela and Hodgins were to leave it would be more about them and less on the other supporting characters, which I do enjoy from time to time. Christine: No, for completely selfish reasons. I love them on the show. As for their characters, I think the change could do them good. If there's a time jump into next season, I'm OK with them having spent a year in Paris and then coming back at the start of next season. Other than that, I want them right where they are. Ashley: If the series were ending, I think I'd like to see them do exactly that. But, now that we know for certain the show has been renewed, they've got to stick around. I do like that they are having those conversations, and I agree with Christine's idea of letting there be a time jump and having them go, but then come back. Was there anything that disappointed you about either "The Lost in the Found" or "The Verdict in the Victims"? Bridget: I was only disappointed in the fact that Fox ran two episodes at once and I expected them to be connected better. Instead these really were two separate cases that just ran back to back to fill in a programming block. I guess I would've expected to see some more of Booth's gambling mentioned as well. Mary Kate: I agree with Bridget. Considering how disconnected the episodes were, it seems odd that they would air them on the same night. There was nothing strongly disliked about the episodes, I just wish they were more connected. Christine: I liked both episodes, but running them back to back did feel odd. Also, it felt like they dropped Booth's gambling problem. I expected to at least see a small snippet somewhere in there. Ashley: Overall, I was pleased with both, but I do agree they were too disconnected to be aired back-to-back. Which of these episodes did you like better, and do you have a favorite quote or scene from either? Bridget: I really enjoyed that we got more insight into teenage Brennan. Even after all these years we are still learning things about her and what makes her who she is today. Anytime we get something like that I enjoy it. Mary Kate: I think I enjoyed "The Lost in the Found" more because it was more interesting to learn about Brennan. The serial killer story didn't appeal to me as much compared to the other long term killers they've had. Christine: I enjoyed them both. "The Lost in the Found" was heartbreaking. To think that anyone could be that broken and lonely that they could do that to them self and the parents who love them. I also really enjoyed the death penalty debate in "The Verdict in the Victims." Ashley: For me, "The Verdict in the Victims" was the best because it brought up a past storyline, which, realistically, is something that would happen more often. What did you think of this episode of Bones? Share your thoughts in the comments below! Need to catch up on past episodes? You can always watch Bones online right here via TV fanatic!